New Notable Quotables Show Featuring Comedian Evan Sayet! Check out the latest episode of NewsBusters’ Notable Quotables comedy show. New Episode of the Notable Quotables Show! End of Year Edition of NQ Show, Featuring Best Quotes of 2009! Here is the latest episode of NewsBusters’ Notable Quotables comedy show. To celebrate the year’s end, this week’s show provides a sampling of the best of the worst media sound bites of 2009. The show features a dramatic reading of the quote of the year, won by Discover magazine deputy web editor Melissa Lafsky for channeling Mary Jo Kopecne while remembering the late Ted Kennedy. It also mocks Newsweek editor Evan Thomas for winning the prestigious ‘Audacity of Dopes Award for Wackiest Analysis’ for his godly description of President Obama. 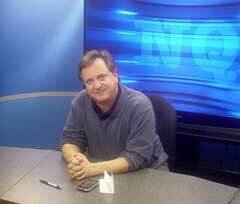 Numerous other outrageous media moments from 2009 provided comedic material to the NQ show cast. Just take a look! Plus, check out the show in a larger format on Eyeblast. New Episode of Notable Quotables Comedy Show! Take a sneak peak at the next episode of the Notable Quotables comedy show. Apparently MSNBC’s Chris Matthews has a very interesting perspective on race relations. Enjoy the show and have a Happy Thanksgiving. Notable Quotables Comedy Show Bonus Footage! Take a look at some extra video footage from the latest episode of NewsBusters’ Notable Quotables comedy show. CBS Evening News anchor Katie Couric interviewing former Vice President Al Gore provided us with so much joke material we couldn’t fit it all in. Here is the latest episode of NewsBusters’ Notables Quotables show, featuring the liberal media’s most outrageous sound bites. Episode three of NewsBusters’ Notable Quotables comedy show is coming soon and as usual, the liberal media have provided plenty of great material. Here’s a quick taste of what’s to come, enjoy! Friday Funny: The Latest Notable Quotable Comedy Show! New Episode of Notable Quotables Web Show! After the premiere of the Notable Quotables comedy web show two weeks ago we got a lot of interest and feedback from readers. Here is the next episode, again, based on the Media Research Center’s bi-weekly publication Notable Quotables.